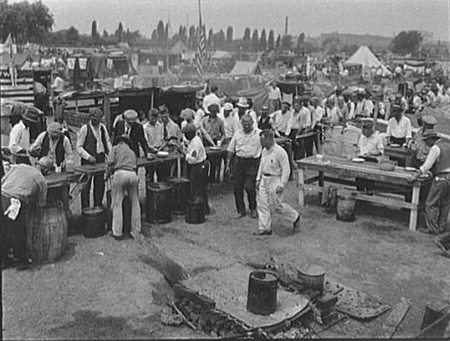 Today in History–July 28–the Library of Congress features the “Bonus Army” or “Bonus Expeditionary Forces (B.E.F. )”, some 15-20,000 World War I veterans who camped out in the nation’s capital to request early payment of cash bonuses not payable to them until 1945. On July 28, 1932 the protestors were met by Major George S. Patton and federal troops—cavalry, machine-gunners, and infantry—under the direction of General Douglas MacArthur on President Herbert Hoover’s orders. Riots broke out but the veterans eventually left. Learn more by visiting the Today in History section, then check out the resources below.